Even in spite of the hundreds of millions of registered profiles that Kik Messenger boasts, the developers still haven’t made any motion to release a desktop app for the online chat application. However, provided you’re willing to jump through a few extra hoops, you can wrangle a version of Kik onto your desktop computer free, at no cost to yourself. You’ll need to make yourself familiar with a different type of computer software–namely, emulators–but don’t let the unfamiliarity intimidate you. It’s a process that’s appropriately simple, and will get you desktop access to one of the most prolific and hip chat platforms currently trending on mobile devices. We’ll go through the whole process, top to bottom, and cover every angle required to get Kik onto your desktop computer. This will include links to emulating software, troubleshooting tips, as well as several cautions that you should keep in the front of your mind as you’re moving through the steps. Since Kik Messenger doesn’t run natively on any laptop or desktop computer (no matter the operating system), you’ll be required to utilize third-party software in order to make the magic happen. With a little bit of caution and only a few necessary steps, none of this will prove an obstacle to you getting your hands on Kik. Though there’s certainly plenty of emulation software that will run Kik for you, only certain versions will remain free while you use them. For the purpose of keeping this guide as friendly as possible for you, the consumer, we’ll keep our focus on the free methods to get Kik Messenger on your desktop computer. The first thing that often throws users for a loop is the fact that you’re not exactly installing Kik Messenger, alone, when you run it on your Windows PC or Mac. Since Kik only runs natively on smartphone operating systems (Android, iOS, and Windows Phone), you’ll need to find a way to run a smartphone operating system on your computer. Think of Kik as an animal that needs a certain type of environment if you want it to thrive on a computer. Since both Windows for Phones and Apple’s iOS feature proprietary software and coding that makes emulation fall somewhere between “a pain” and “impossible,” users have come to rely on the Android operating system in order to get Kik on their desktop computers. As you might imagine, smartphone operating systems are remarkably less memory-intensive than the type of operating system that you use on your desktop. This means that an emulator is a viable option even on old or less expensive computers with less powerful hardware. As an added benefit, finding a good emulator means that you’ll be able to run other Android apps as well, in addition to Kik. Setting you off on your own without any idea of what Android emulator would best suit your needs would be borderline cruel, on our part. The internet is filled with emulation software. Some of them are stellar, and some of them barely work. Some of them are frequently updated to reflect updates in the actual Android OS, and some of them are ridiculously old. Some of them are free, and some of them aren’t. Kik Messenger is free to download and apart from any data charges that you incur on your particular internet connection, it’s also free to use. Why not keep your choice in emulation free, too? A few particular Android emulator software packages rise to the surface of the many that exist. They have professional-quality developers behind them, which means that they’re going to be a great deal more reliable than others. Without further ado, let’s introduce you to a few of them. 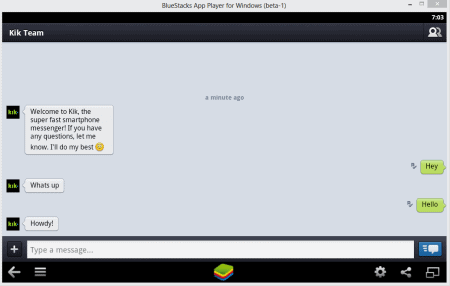 It would be difficult not to first mention Bluestacks, an Android emulator that’s frequently mistaken for an official Google development kit (it certainly isn’t!) Though the development team behind it is exceptionally talented, and the software itself is presented quite professionally, it remains a standalone emulator that isn’t affiliated with Google. Though this emulator is marketed primarily towards gamers on Android OS, the emulator itself is powerful and capable enough to handle most Android apps, including–you guessed it–Kik Messenger. In order to use the free version, you’ll have to be tolerant of a moderate amount of sponsored advertising in the app. This can only be disabled through a “premium” subscription. While it’s not particularly costly, free is better! The advertising is never particularly intrusive though I would recommend keeping malware and virus detection software running on your computer. Up next is Andyroid, and though it’s not presented as brightly as Bluestacks, this is actually the Android emulator that I prefer out of the bunch. Like the other options in this list, Andyroid works for Mac and PC, and is also free! Additionally, the development strives to always keep Andyroid updated to the latest and greatest version of the Android OS, meaning that you’ll also always be able to run the latest version of Kik Messenger. Between the two, I’ve found Andyroid to have the less intrusive presence on your computer once it’s installed, and while the emulation software that you choose is definitely important, the apps that you’re emulating are the whole reason for doing it! If Bluestacks didn’t catch your immediate appeal, Andyroid is the way to go. If you’re looking for an emulator that has the flash and professional presentation of Bluestacks but aren’t interested in the way that the platform is marketed towards gamers, give Genymotion a look! While is an excellent emulator and will certainly suit your purposes, it also has a bit more of a learning curve than our other two entries. While the free version of Genymotion is great for individual users that just want to run some Android apps (like Kik! ), it also has paid versions of the emulation software that are suited more for businesses or developers. Since you don’t need any of these, you can beeline straight for the free version. Though you should certainly take your time in picking an emulator that you find most appealing, don’t worry about the decision too much. Ultimately, while some software and its accompanying features might be more appealing to you, the end goal is the emulation of Android apps. Since the goal of each of the above emulators is to replicate that mobile experience as accurately as possible, you’re going to end up with similar results no matter which one you choose. Pick one, download it, and install it on your desktop. Thankfully, once you have your emulator set up and running, actually getting Kik is a simple task. Because it’s a free app to download, you’ll go about it in the same exact way that you would if you were on an actual mobile device running Android. You’ll want to access the Google Play app store and search for Kik. While ignoring any third-party apps that purport themselves to be “Kik companions,” select the Kik Messenger app itself and begin the download! Any and all Kik activity that happens on your desktop will take place within the confines of your Android emulator, so you can easily imagine that you’re installing Kik to your desktop. Once you have Kik up and running, whether or not you know what to do next will depend on whether you’ve used the app before. If you already have a Kik profile, simply enter your username and password. You may be emulating an Android environment, but you’ll absolutely be connecting to the Kik servers through 100% legitimate means. As with any device that you’re logging into Kik from for the first time, you won’t have access to any chat or browser history. Your contacts, however, will be entirely intact and waiting for you. All of your favorite Kik features will be available in this emulated version of the application. After all, this isn’t technically a “desktop version” of Kik at all; if everything has gone well with your emulator, then you’ll actually be running a perfectly replicated version of the authentic Android version of Kik. As long as you’re willing to go to a little bit of extra trouble, you can host Kik on your Windows PC or Mac just as “free” as you can on a smartphone. To boot, you’ll be escaping the constricting screen real estate and pocket-size interface of the Kik application on such smaller devices. For a few extra steps, you’ll be giving yourself wider and better access to one of the most popular chat applications on the market. Emulation is by no means a new development in the software world. It grows just as quickly as the operating systems that it mimics, and so revisiting the topic of “which emulator is best” can result in different choices as new contenders enter the field. Similarly, everybody’s experience is going to be slightly different depending on which emulator they choose. Once you’ve downloaded the Kik app for your desktop computer, chime in through the comments below to let us know how well it worked!